We all have those pesky beauty issues that never seem to go away. Whether it be your weak nails, unruly eyebrows, smudged liner, or chapped lips, the list goes on and on. We decided to pull out ten of our most common problems – those ones that just never seem to be truly fixed – and let you know how you can put an end to the annoyance. Hopefully, by following the tips below you’ll have ten less beauty qualms to worry about, and more free time to become a pro at the latest trends. Be sure to comment below on which of the most annoying problems you’re going to fix stat! Flyaways: Sweep those baby hairs away with a little smoothing wax and hairspray over top for the ultimate protection. Bleeding Lipstick: Before applying lipstick, apply a balm to make sure lips aren’t chapped. Then line the lips with a lip liner (that matches your lipstick) and you’re ready for lip color! Flaky Skin: Coconut oil is a great moisturizer for the skin and works wonders. Apply on dry areas of skin before applying makeup. Chipped Nails: When the chip just happens, try to smooth lightly with your own finger. If this doesn’t work, apply another color over top with a sponge and create an ombre effect that is super chic. Mascara Clumps: When at a makeup counter ask if they have any mascara wand samples that would be used to test product. Save them and use the product free brush to comb through lashes after applying your mascara. Razor Bumps: Shave with the direction that your hair is going and you will be bump free (also, remember to exfoliate to un-clog pores). 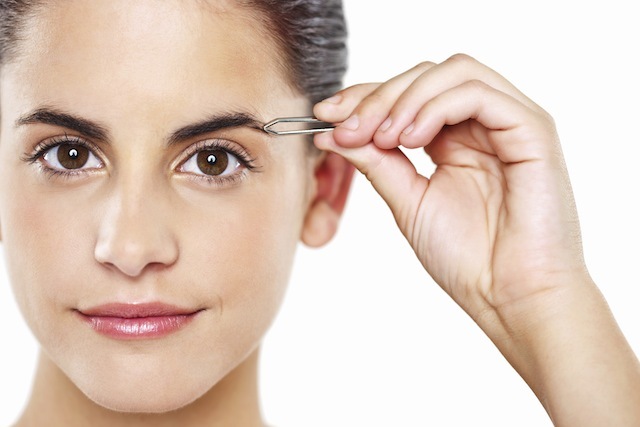 Over-Tweezed Eyebrows: Penciling in your brows is the best way to fix this. Follow the small arch you have and branch out to create a thicker brow. Broken Compact: Gather as many pieces as you can and apply some rubbing alcohol into the compact. Carefully press the pieces in a little and let it dry out overnight to be solid by morning! Hairs Falling Out Of Makeup Brushes: Wash the brush with baby shampoo and allow the brush to dry with the bristles facing down so the spare ones will shed. Dried Out Liner: Put a few drops of water in the tube of liner and allow the product to mix with it. This will give you a little more time to go out and purchase a new one!